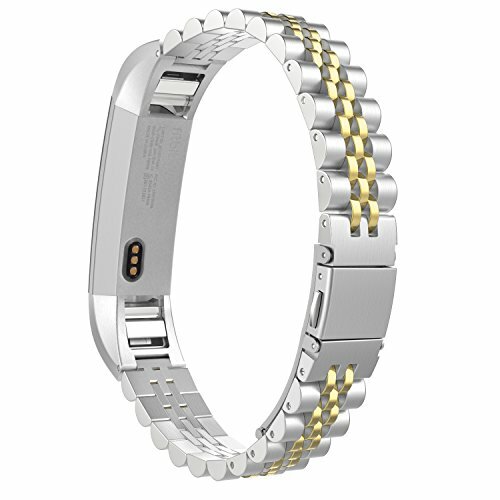 Custom designed for your precious Fitbit Alta / Fitbit Alta HR Smart Fitness Tracker, this MoKo Premium Solid Stainless Steel Metal Replacement watch Band features a combination of functionality and style. * Personalized Your Fitbit Alta / Fitbit Alta HR Smart Fitness Watch with this refined replacement stainless steel wrist band with triple safety folding clasp and push-piece opening mechanism. * Band comes with Fitbit Alta / Fitbit Alta HR Smart Watch Lugs on both ends, which locks onto Fitbit Alta / Fitbit Alta HR Watch Band Interface precisely and securely. Easy and direct installation and removal. * Fits 5.51"-8.26" (140mm-210mm) wrist and 0.45" (12mm) in width. * Equipped considerate items with a set of withdrawal tool. Fits 5.51"-8.26" (140mm-210mm) wrist and 0.45" (12mm) in width. Equipped considerate items with a set of withdrawal tool. Personalized Your Fitbit Alta / Fitbit Alta HR Smart Fitness Watch with this refined replacement stainless steel wrist band with triple safety folding clasp and push-piece opening mechanism. Watch NOT included.